In the world of NFC technology there are constantly exciting new innovative ways for consumers to use their smartphones to more easily accomplish tasks. 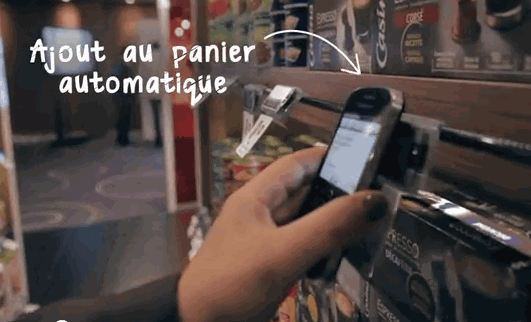 There is now a major grocery store chain in France that is set to launch what is being called the world’s first fully NFC-compatible supermarket. Shoppers will tap their NFC-enabled phone next to the items they choose to buy and put them into their cart as they go along. At the check out the shopper will tap their phone to the register to pay for all of their items. Shoppers will download and use a special app designed for the store on their smartphone and next to every item in the store are special NFC tags that transmit information about the product to the user’s phone. This not only allows users to see clear pricing details on the products but also gives the user the opportunity to check nutritional information and other data before they decide to add it to their cart. Other advantages beside the convenience of using NFC technology for grocery shopping include being able to link the customer’s loyalty card to the app making it easier to receive discounts. And this also allows the user to more easily track their total grocery bill while shopping. Here’s a short Youtube Video with a demonstration of a woman grocery shopping and doing other average day activities using a BlackBerry Bold 9900 and the NFC capabilities.